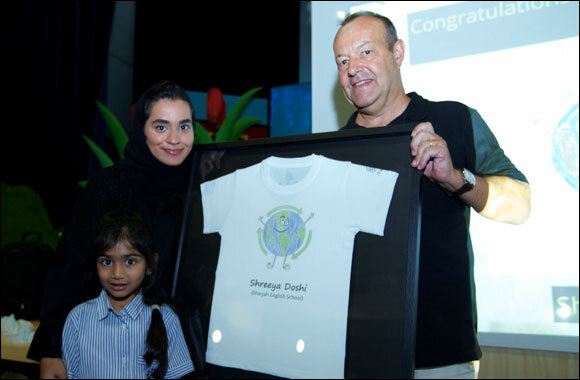 Kris Barber, CEO of DGrade and Shaima Al Awadhi, Communications Analyst, Corporate Affairs of PepsiCo Middle East & Africa, congratulate 6-year old Shreeya Doshi from Sharjah English School for winning the DGrade Plastic Challenge design competition, sponsored by PepsiCo's Aquafina. Shreeya was one of hundreds of UAE students to take part in the competition, which aims to encourage pupils to recycle plastic bottles. Her winning t-shirt design, which received more than 2,400 Facebook votes, was printed on a t-shirt made using three plastic bottles.